Click here to download a source sheet on holy use. We live within a society transformed by the consumer revolution. In the mid- and late 20th century, consumer products became widely available in the United States and Europe. When something breaks, the question may arise, repair it, or get rid of it and buy a new one? If it is cheaper to buy a new one, many people are reluctant to go through the hassle of trying to repair it. With material goods so abundant and cheap today, it is easy to throw things away. We discard clothing and appliances and buy new ones instead of repairing them, or throw away useable items because they are a few years old and maybe outdated by new products. People living in consumer society relate to material objects in a vastly different way than people did in previous times. The decision whether to reuse or discard an object in part emerges from how a person relates to material possessions: as essential or expendable, indispensable or disposable. This is where Jewish tradition is so relevant today. Age-old Jewish teachings reveal a Jewish vision for 'holy use' of the material world which can reorient a person toward environmentally sustainable resource use. These teachings can deepen our understanding and inform our actions about a subject in which the Western world has recently taken an interest. We will explore how reuse of material objects contains physical benefits for people and the planet and spiritual fruits as well. A teaching from the Midrash (rabbinic commentary on the Torah) sheds light on a Jewish ethic of sustainable resource use. Before the epic encounter between Jacob and Esau, Jacob brought his family and possessions across a stream. He returned at night to the other side of the stream, and the Torah narrates that: “Jacob remained alone.” The rabbis see the word “alone” (levado) as superfluous, and understand it as related to the similar looking word lecado, “for his vessel,” yielding, “Jacob remained for his vessel.” That is, say the rabbis, he re-crossed the stream at night to recover a few small vessels he forgot to bring across. Why did Jacob, facing an imminent confrontation with Esau and his 400-man militia, leave his family alone and vulnerable at night to recover a few forgotten flasks? Why were they so important to him? The seeming absurdity of Jacob’s action becomes understandable when one examines Jacob's worldview: he believed that everything in his possession comes from God, has a specific purpose and must be used to its full potential. As one medieval commentary explains, each material item that a righteous person uses is a means toward a spiritual repair in the world. Jacob went back for the vessels to ensure they were used in the optimal way. Had he not, their full potential would not have been realized. The truly righteous recognize the value of their God-given possessions, and are very careful with them, no matter how small or seemingly insignificant they are. While not overly attached to material things, they do not dispose of objects prematurely or use them inappropriately. Reuse is their message, not recycle. "Everything in the world has in it sparks of holiness that fell at the time of the Shattering of the Vessels. 'Shattering' is the aspect of letters that shattered and fell into each and every thing of this world. For every thing has its time: it must come at that time, to that person who shares the same root with those sparks in that thing. Thus, when that thing comes to this person, and he receives vitality from it — i.e., from the shattered letters that are there — through this the shattered letters are encompassed in this person, in his vitality. They become a complete entity, and infuse the vitality of the entire body. Through this the letters are restored and become complete. Then that thing must stay with this person, for him to use, until the letters and sparks that are associated with his root terminate. After this it leaves his possession for someone else; the time has come for the remaining letters to have an ascent. They share the same root with that other person and so depart for his possession." According to this understanding, an object comes to a person for the purpose of spiritual elevation. Reuse of a physical object enables a further spiritual elevation of the sparks of holiness within the object. The Talmudic sage Rabbi Yochanan ben Zakkai, on his deathbed, told his students to remove the vessels from his room lest they become contaminated by his corpse, and thereby unusable. He acted so that others would be able to reuse the vessels after he died. In the 20th century, Rabbi Yaakov Kanievsky, the Steipler Rebbe, instructed his children to straighten a bent nail and use it in building their sukkah so that it would not go to waste. By raising the sparks to Heaven, we also refrain from littering the earth. These examples show the relationship our sages had with material objects, and the effort they invested in elevating the holy sparks in the objects. The commandment of building a Sukkah (covered dwelling) is also relevant regarding reuse. The Torah instructs, “You shall make yourself the Festival of Sukkoth for seven days, when you gather in [the produce] from your threshing floor and your vat.” Note that the verse links the festival of Sukkoth, whose primary mitzva involves living in the Sukkah, with the gathering in of produce from each Jewish farmer's wheat threshing floor and wine vat. The rabbis of the Talmud pick up on this linkage to make a further connection — that the agricultural refuse from the threshing floor and wine vat should be used as the covering (schach), the most essential part of the Sukkah. Rabbi Natan of Breslov explains a deeper meaning of the Talmud's teaching. The Sages teach that before the sin of eating from the Tree of Knowledge of Good and Evil, Adam did not produce waste because he fully assimilated everything he consumed. Rabbi Natan of Breslov notes that in the Garden of Eden, Adam and Eve were to eat fruit, but after their sin, people moved toward the level of animals by eating foods that grow from the ground, and having to work very hard to process grains into bread. The sin also led to a more animalistic way of life in which more waste is produced, unlike before the sin. We can repair the sin by showing we recognize that the agricultural waste from processing the wheat and grape harvest is not garbage. Rather, it can be used to create the Sukkah and enable celebrating within a holy space on the festival of Sukkot. Reduce, reuse, recycle. What does this saying signify, and how does the Jewish tradition relate to it? The phrase contains within it a descending order of preference: first reduce, then reuse, and then recycle only as a last resort. While recycling is often synonymous with 'green,' acts with far greater environmental impact are reducing what one uses in the first place, and reusing that which one does use. "Our enormously productive economy…demands that we make consumption our way of life, that we convert the buying and use of goods into rituals, that we seek our spiritual satisfaction, our ego satisfaction, in consumption…We need things consumed, burned up, worn out, replaced, and discarded at an ever increasing rate." Western society ritualizes consumption, whereas Jewish practice ritualizes reuse. Jewish sources abound with examples of reusing ritual objects. The Torah notes that the copper firepans of Korach and his assembly were melted and reused to form the outer layer of the altar. The Talmud records how two Sages, Rav Ami and Rav Asi, would reuse bread used in the ritual of making a courtyard eruv (ritual enclosure) for Shabbat by blessing over it and eating it. Concerning this reuse of ritual bread, Rav Ami and Rav Asi said, “Since one mitzvah was done with it, we should use it for another mitzvah.” The principle these Talmudic sages state — of using a ritual object for multiple rituals--manifests in a number of other Jewish practices. One example is a custom to use the myrtle from the lulav bundle (four species) of Sukkot as the pleasing fragrance for Havdala, based on the mystical tradition of the Zohar. Many other examples exist. What might be the reason for reusing ritual objects? Since one mitzva has been done with it, the object has been infused with holiness. In doing a separate mitzva, it is preferable to use such an object, because its elevated holiness will enable the second mitzva to be done at a higher level of sanctity. The Jewish tradition therefore clearly contains instructions for reuse of certain objects, in this case for spiritual reasons. The reuse of ritual objects contrasts with the trend Victor Lebow described above. Disposing of consumer items has only become more pronounced in the last half century, as material goods have become cheaper and more available. The cheapness of new products serves as a disincentive for incurring the cost of repairing an item that breaks. In America, one can purchase disposable barbeques. In Jerusalem, entire stores are devoted to selling disposable products. These are the consequences of a human society that does not fully assimilate that which it consumes – a disposable society. When one is accustomed to throwing out disposable dishes and to disposing of cheap electronic goods whenever they break, the value of material goods becomes diminished in one’s perception. Cell-phones, refrigerators, and cars can become disposable when the cost of buying a new one is less than the cost of repairing it. Such a lifestyle habituates a person to devalue things that do have value. Even relationships—of friends, parents, spouses—can be viewed as disposable within such a mindset. Let us examine what happens to some plastic waste — from bags, forks, plates and bottles — which is not reused or recycled. After we throw it “away,” some of the plastic we use likely makes its way to the oceans. The United Nations Environment Program (UNEP) cites a 1997 estimate from the U.S. Academy of Sciences that each year, humans put 6.4 million tons of marine litter into the oceans. The UNEP continues that “according to other calculations, some eight million items of marine litter have been estimated to enter oceans and seas every day, about five million of which are thrown overboard or lost from ships. Furthermore, it has been estimated that over 13,000 pieces of plastic litter are floating on every square kilometer of ocean surface.” Huge patches of garbage and plastic have been reported in the Pacific and Atlantic Oceans. What impact does this marine debris have on ocean ecosystems? According to the U.S. National Oceanic and Atmospheric Administration Marine Debris Program, this debris entangles sea life, and harms marine animals such as sea turtles, seabirds, and marine mammals who come to eat the debris. Furthermore, marine debris can “damage important marine habitats, such as coral reefs. Many of these habitats serve as the basis of marine ecosystems and thus they are critical to the survival of many other species.” Plastic waste in the oceans is thus not merely an eyesore for people, but a threat to a wide array of marine life. Humans depend on healthy marine life for food consumption. Indeed, some countries harvest from the oceans a significant percentage of their dietary intake. Another example of waste from modern society is spent fuel rods from nuclear reactors that generate electricity. The nuclear crisis in Japan in 2011, following the Chernobyl nuclear accident of 1986, highlighted the risks involved in nuclear energy which produces nuclear waste. The New York Times reported that according to figures provided by the Tokyo Electric Power Company, which operates the six reactors at the Fukushimi nuclear plant, “11,125 spent fuel rod assemblies were stored at the site. That is about four times as much radioactive material as in the reactor cores combined.” Since nuclear waste lasts for so long, it can never really be "disposed" of, and must be stored. In Japan's case, the waste was stored in a place vulnerable to earthquakes and tsunamis. In the United States, storage of nuclear waste also presents a challenge, and no long-term solution has been found. In conclusion, how could it be that we generate so much waste? That brings us back to the small vessels — one plastic bag at the checkout stand, one plastic yogurt container — multiplied by decades of such consumption and now billions of people. Things add up. Jacob’s going back for two or three vessels teaches us that little things matter. In our consumer age the message has only become more relevant. Today's abundance and affluence presents both an environmental and a religious challenge—of using the physical world in a mindful, holy way. May we live up to the task and leave our children a planet that testifies to the glory of its Creator. For more on this, see Waste and Want: A Social History of Trash, by Susan Strasser, Henry Holt and Co., 2000. Rashi to Genesis 32:25 based on Babylonian Talmud, Chulin, 91a. The Gur Aryeh (Maharal of Prague) on 32:24 says these were two or three very small vessels. Baalei Tosafot on 32:25 understand levado except for the letters bet and chaf, which look very similar. Orchot Tzaddikim on Genesis 32:24. Medieval, anonymous rabbinic Torah commentator. According to Kabbala, when God created the world, the vessel was not able to contain the Light, and shattered into "sparks" which are dispersed throughout the world. Likutei Moharan, section 54c, translation reprinted with permission from The Breslov Research Institute, Jerusalem. Deuteronomy 16:13, Judaica Press translation. Babylonian Talmud, Tractates Rosh Hashana 13a and Sukkah 12a. The following is based on Rebbe Natan of Breslov, Likutei Halachot, Choshen Mishpat, Hilchot Mekach u'Memkar, halakha 4, section 8, as taught by Rabbi Natan Greenberg and Rabbi Daniel Kohn of Yeshivat Bat Ayin. “The Journal of Retailing,” Spring 1955, p. 7, quoted in Durning, How Much is Enough? (1992). Numbers 17:3. The Talmud in Tractate Menachot 99a records how Rabbi Acha bar Yaakov cites this verse as the example of the principle of only using holy objects again for a more holy use. Babylonian Talmud, Tractate Berachot 39b and Tractate Sahbbat 117b, and Jerusalem Talmud, Tractate Eruvin 86:7. Such a practice of eating this bread after it has been used for the eruv chatzeirot (courtyard ritual enclosure) is codified in the Rama to Shulchan Aruch, Orech Chaim 394:2. See also Taz there. This practice is codified in Jewish law as a practice for Jews of European-descent. Shulchan Aruch, Orech Chaim, 297:4, based on Zohar, Parshat Vayhakhel, p. 94, as cited by Darchei Moshe to the Tur. This explanation of the Talmudic teaching of Rav Ami and Rav Asi is based on the explanation given by Rabbi Adilman in his article cited above. For example, the EZ-Grill Portable Disposable Barbeque is available for purchase on Amazon.com. Charles Moore, founder and research coordinator of the Algalita Marine Research Foundation, first reported on the Pacific Ocean patch in 1997. Rabbi Yonatan Neril founded and directs Jewish Eco Seminars. He conducted food-policy research in Mexico while studying at Stanford University, where he earned his bachelors and masters degrees. 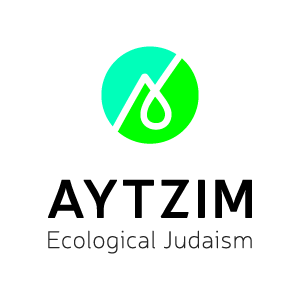 Posted as part of Jewcology's "Year of Jewish Learning on the Environment," in partnership with Canfei Nesharim. "We have a very green system: We recycle our prime ministers." With about 70% of its treated sewage water being reused by agriculture, Israel leads the world in wastewater reuse.